After going to the expense of landscaping your Bellingham or Ferndale home, you should take steps to preserve your investment. The lawn must receive proper care and routine lawn maintenance is necessary to keep your landscape and yard looking it’s best! Grass needs mowing as well as fertilizing. This is often done in the late fall. Flowering shrubs and perennials need pruning annually. A healthy lawn should also be aerated once a year. Mulching your flower beds helps keep moisture in as well as forming a barrier for keeping weeds out. A seasonal yard clean-up in both the fall and again in the spring keeps leaves from piling up in the yard, keeping it free from developing any fungus or mold. To operate an irrigation system so that it is most effective at watering, the system must operate properly. Timers must water the grass efficiently, and there must not be any overlapping watering zones. The prime benefit of a well-maintained lawn is its natural beauty and the pleasure it gives the homeowner on a daily basis. Green grass and healthy shrubs also add to your home’s worth. The weather can affect the lawn’s appearance. If a homeowner doesn’t have the time or physical ability to take care of routine yard and landscaping maintenance, Green Thumb Company can! 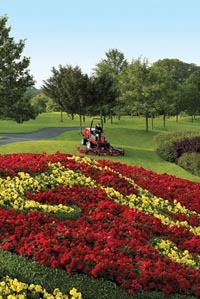 We are able to set up an affordable season-long contract for yard maintenance or feel free to call us as needed. It is necessary to wear personal protective equipment when doing lawn or yard maintenance. Turn off all electrical systems for the irrigation system before performing routine maintenance to avoid the danger of electrocution. If you would like to increase your home’s investment or simply have a desire to have your yard looking it’s best, please give us a call at 360-671-LAWN (5296). We would love to talk to you about your Bellingham or Ferndale or Lynden landscaping or yard maintenance.